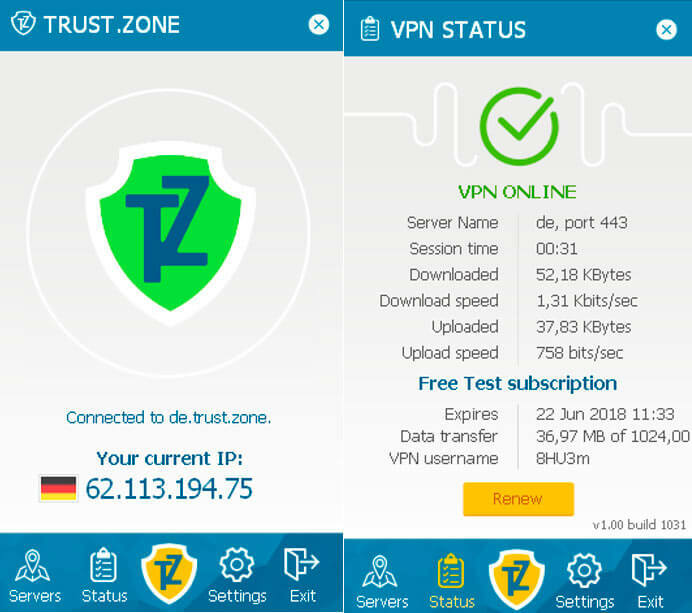 Home » Trust Zone VPN Review: Worthwhile 3-day test? It is often useful to have a worthwhile free VPN at hand. 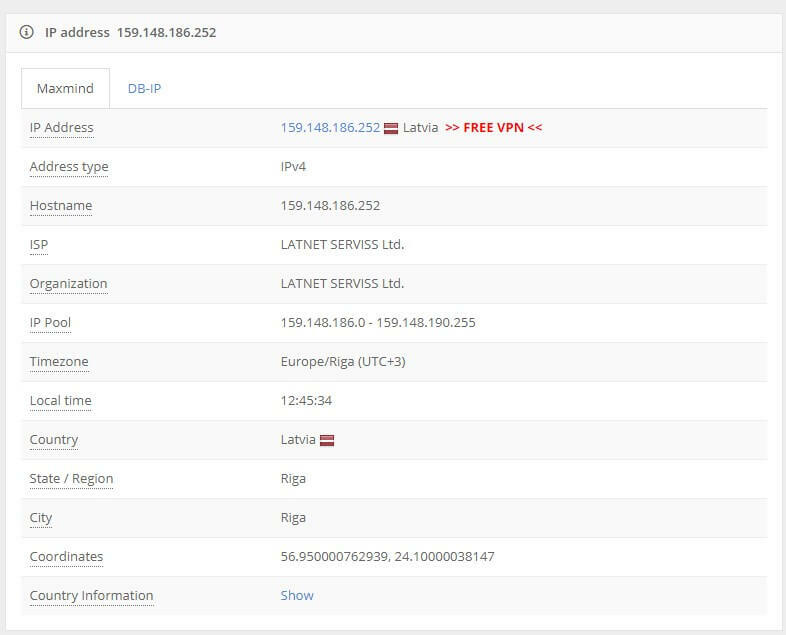 On our website you may find various VPN reviews made by our team. Among them are such popular free VPN services as Windscribe, Avast, Hola and others. I found another cool free VPN to unblock websites while you are abroad for several days. Is Trust Zone VPN worth being applied for this? After you read the review up to the end, you will learn the truth about this VPN Got interested? 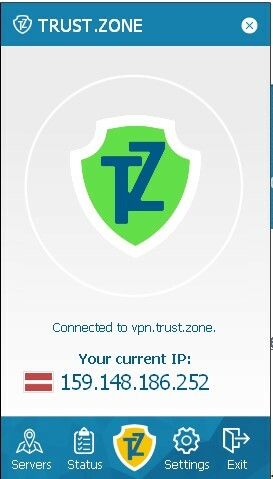 In what countries Trust Zone VPN has servers. 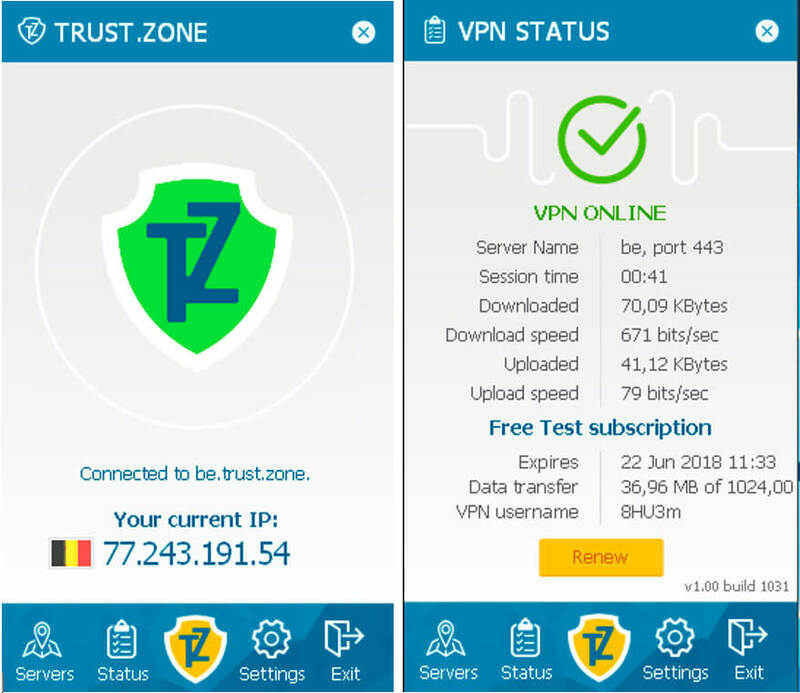 How can you use Trust Zone VPN for free? 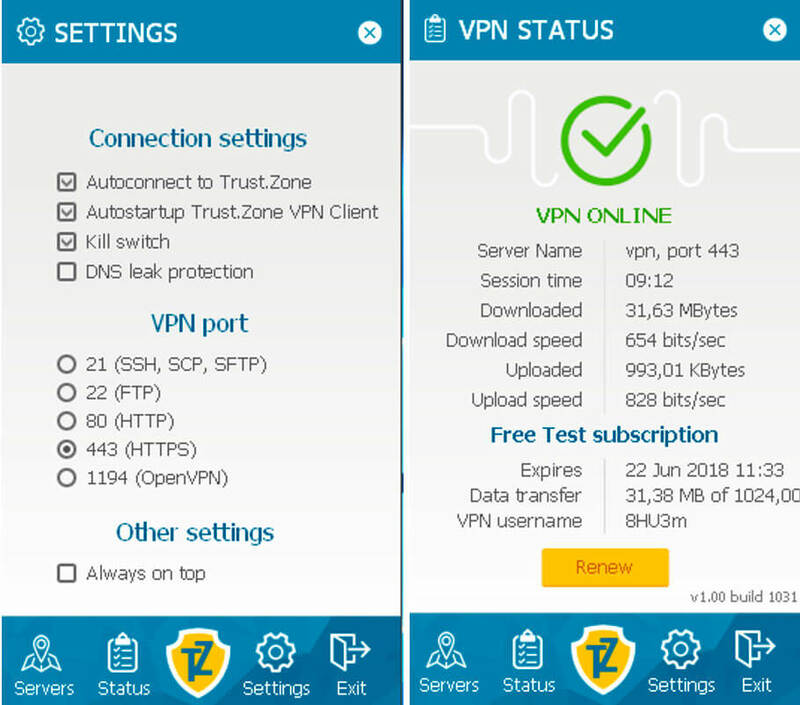 As it can be seen from the screenshot provided below, Trust Zone VPN is accessible free of charge for 3 days as a free test before you subscribe for their paid plans (In case you need a VPN for a short period of time, Trust Zone VPN can be considered for this). What you can do with Trust Zone VPN for three days without paying money for it? Transfer no more than 1GB of data during the test period. Take use of unlimited bandwidth. Use it only for one device. How to start using Trust Zone for free? 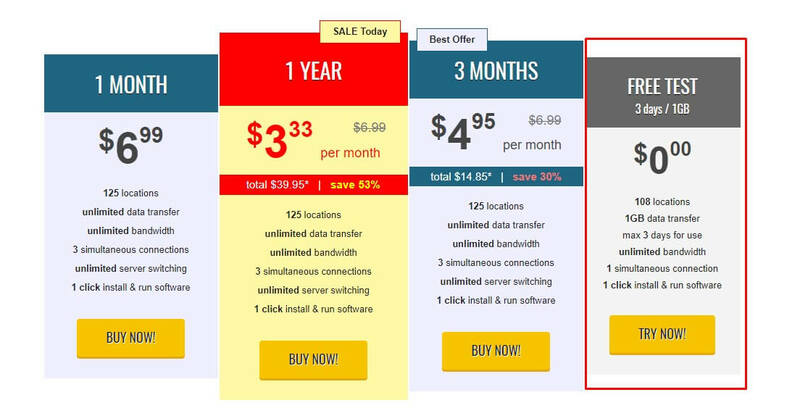 Click ‘’Try now’’ in ‘’Pricing’’ section with a free test. 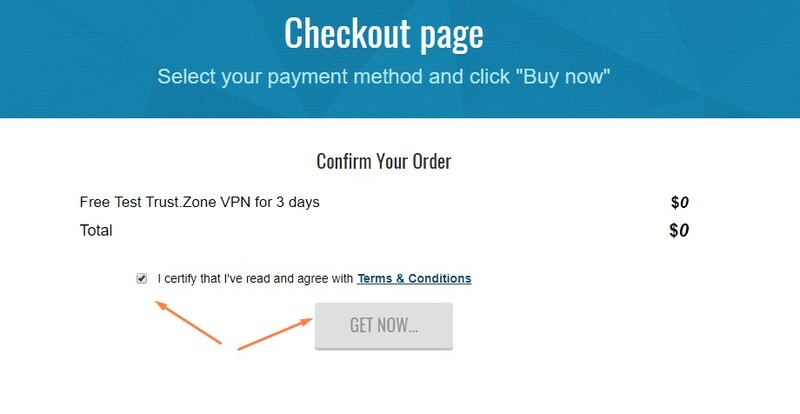 Then you will see the checkout page where you will be offered to read Terms & Conditions and press ‘’Get Now”. 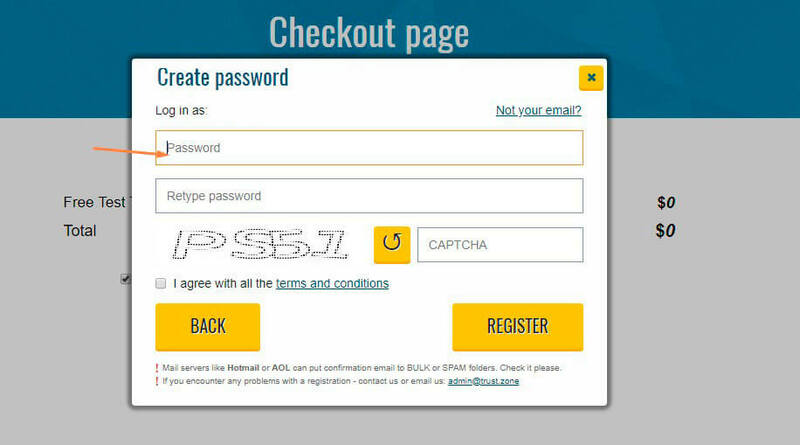 The next step will be to confirm your order by providing your e-mail address and creating a strong password. If everything is ok, you will see this window which means the free test has been added. The last thing is left to finish the subscription. You need to go to your e-mail and activate your account by clicking the link in the letter you receive from Trust Zone VPN. From that moment the free subscription is activated. Note: Be sure you add it, before your trip, but too in advance so that it won’t expire, for instance, during the first day of being abroad. You will find the link for checking your subscription list in the letter from Trust Zone VPN. 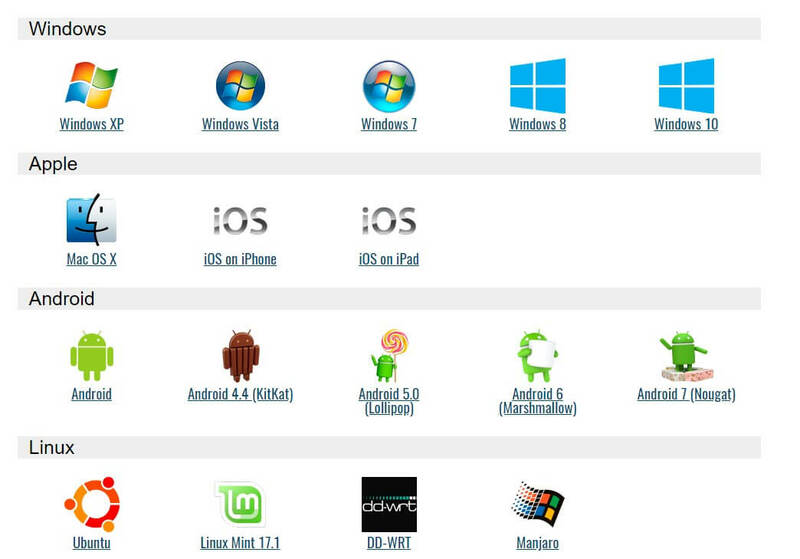 Trust Zone VPN works on Windows (starting from Windows XP version), Mac, iOS (on iPhones and iPads), Android, Linux. Besides, it can be installed on Xbox, Play Station, SmartTV and Amazon Fire Stick. The traffic passed through the network of Trust Zone VPN is encrypted with a 256-bit encryption key. For another thing, Open VPN and L2TP/IPSec protocols are applied for transferring the data. Users are offered to configure a manual VPN connection or a VPN client which is more convenient and fast to set up. Installation is quick and easy: choose a language and do a few clicks. The setup process is automated, you have to perform minimum actions. 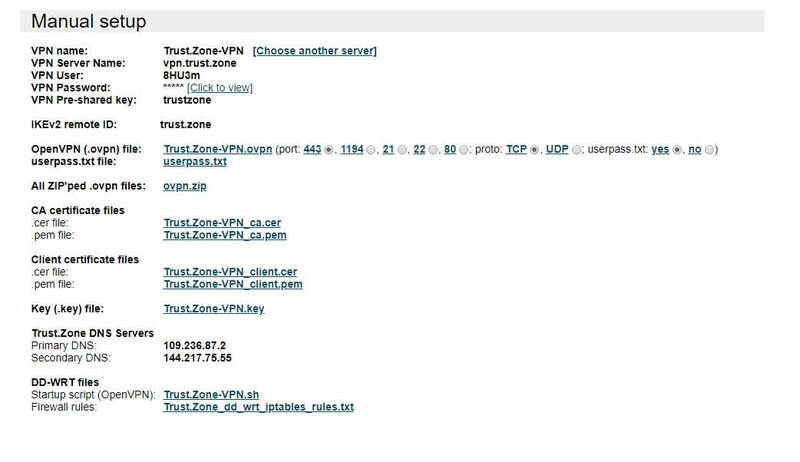 If you see the window from the screenshot, Trust Zone VPN client for Windows is ready to use. The client looks like this: the interface is rather user-friendly and easy to understand. A user can look through the server list and change the server for being connected. 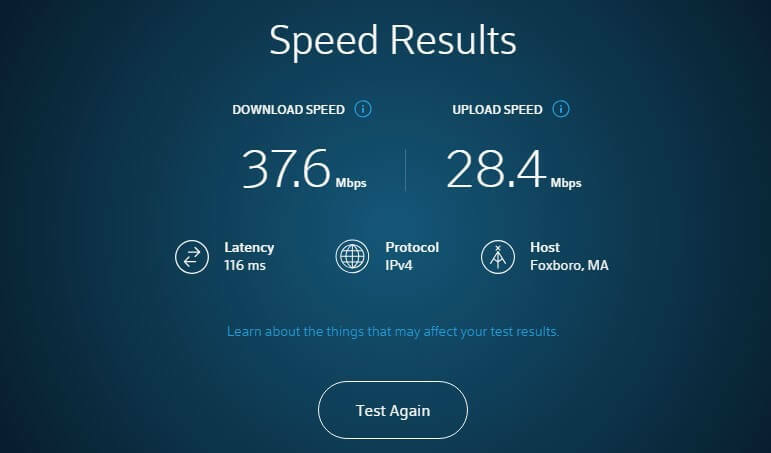 Besides, ‘’Status’’ section provides the detailed information on your subscription, session time, downloaded and uploaded data, internet speeds with the VPN. A user can enable auto-connection to Trust Zone VPN. One can enable auto-startup function for Trust Zone VPN client to start automatically. You have the opportunity to turn kill switch and DNS leak protection on/off (it is recommended for privacy). It is also possible to select a VPN port for connections. Hong Kong, Singapore, India, Japan. Austria, Belgium, Bulgaria, Czech Republic, Denmark, Finland, France, Germany, Hungary, Latvia, Netherlands, Norway, Romania, Russian Federation, Sweden, Switzerland, Ukraine, UK. 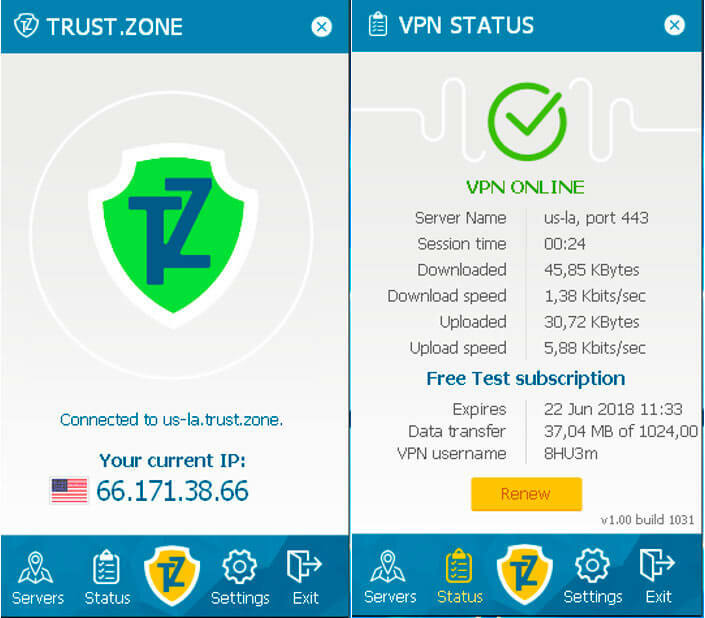 Is Trust Zone VPN safe? If you need a free VPN for a longer period. Don’t hesitate to share your point of view for cooltechzone.com. We greatly appreciate your opinion! See more in our dedicated article.